The type was a slightly larger development of the earlier Nieuport 11, and had a more powerful engine, larger wings, and a more refined structure in general. At first, it was equipped with a 110 hp (82 kW) Le Rhône 9J engine, though later versions were upgraded to a 130 hp (97 kW) engine. It had outstanding maneuverability, and an excellent rate of climb. Unfortunately, the narrow lower wing, marking it as a "sesquiplane" design with literally "one-and-a-half wings", was weak due to its single spar construction, and had a disconcerting tendency to disintegrate in flight. 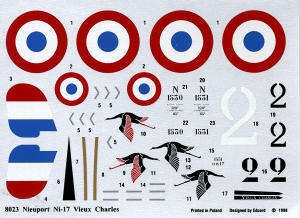 Initially, the Nieuport 17 retained the above wing mounted Lewis gun of the "11", but in French service this was soon replaced by a synchronizedVickers gun. In the Royal Flying Corps, the wing mounted Lewis was usually retained, by now on the improved Foster mounting, a curved metal rail which allowed the pilot to bring the gun down in order to change drums or clear jams. A few individual aircraft were fitted with both guns - but in practice this reduced performance unacceptably, and a single machine gun remained standard. The type reached the French front in March 1916, and quickly began to replace the Nieuport 11 in French service. It was also ordered by the Royal Flying Corps and Royal Naval Air Service, as it was superior to any British fighter at that time. Worthy of note is the fact that during part of 1916, the Nieuport 17 equipped every fighter squadron of the Aviation Militaire. The Germans supplied captured examples to several of their aircraft manufacturers for them to copy. This resulted in the Siemens-Schuckert D.I which, apart from the engine installation, was a close copy and actually went into production, although in the event it was not used operationally on the Western Front. By early 1917, the Nieuport was outclassed in most respects by the latest German fighters. Newer models (the Nieuport 24 and the 27) were brought out in an attempt to retain the type's ascendency. 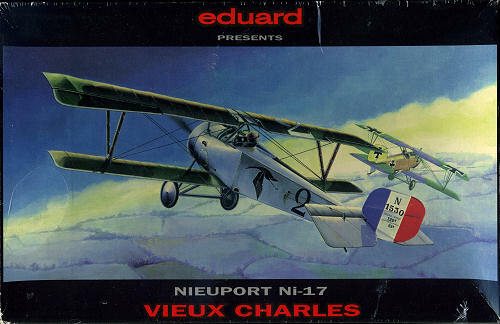 However, the SPAD S.VII had already replaced the Nieuport fighters in many French squadrons by mid-1917. The British persisted with Nieuports a little longer, not replacing their last Nieuport 24bis until early 1918. Many Entente air aces flew Nieuport fighters, including Canadian ace W.A. Bishop, who received a Victoria Cross while flying it, and most famously of all, Albert Ball. Like the other Nieuport types, the 17 was used as an advanced trainer for prospective fighter pilots after its operational days were over. Picked this one up at the LHS while looking for deals and at ten bucks, I couldn't pass it up. It is their 1998 boxing, making it one of Eduard's earlier kits. The molding is quite nice with just a tad bit of mold misalignment in some of the parts. No major glitches aside from a few light depressions on the fuselage and another thick piece, and no photo-etch or vacuformed plastic. 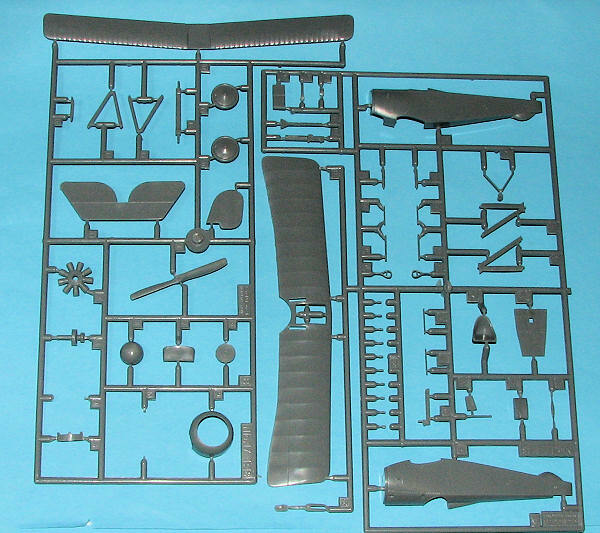 There are two standard sprues and one small sprue with the clear windscreen. The wings and other flight surfaces are admirably thin and while there is some 'hill and va lley' on the wings, it is quite tame compared to what some other companies have molded in the past. As you'd expect with a kit as simple as this, there really are no options, though not all would want to use the spinner if doing a differnt aircraft. Instructions are well drawn with 10 construction steps. Colors are provided in a number of paint manufacturers so you are sure to have some of these available. A well done rigging diagram is also provided and is thankfully quite basic as biplanes go. As this boxing is for Georges Guynemer's planes, the differences between them are somewhat small. One is overall aluminum and this one carries the pennant with the 'Vieux Charles' tag. The other has a different serial, a different style of 2 and the stork is a bit different. It is shown on the box art and has camouflage on the upper side of the upper and lower wing. No upper wing roundels, either. The decal sheet is very nicely done and printed in Poland, perhaps by Techmod. Despite not being a brand new mold, it is still a very nice kit and with enough detail to keep most modelers happy. Its minimal rigging makes this one a perfect first WWI kit for those ready to give rigging a go. The availability of aftermarket decals also adds to the possibilities. Can't pass up a bargain kit.